In the normal system, the calculation of a profile shifted helical gear, the working pitch diameter dw and working pressure angle αwt in the axial system is done per Equations (6-10). That is because meshing of the helical gears in the axial direction is just like spur gears and the calculation is similar. 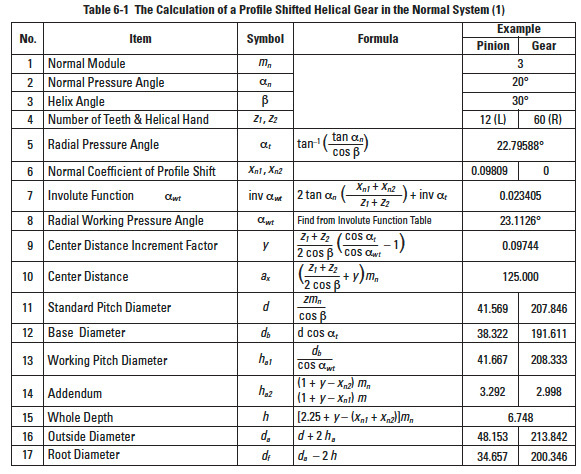 Table 6-1 shows the calculation of profile shifted helical gears in the normal system. If normal coefficients of profile shift xn1, xn2 are zero, they become standard gears. If center distance, ax, is given, the normal coefficient of profile shift xn1 and xn2 can be calculated from Table 6-2. These are the inverse equations from items 4 to 10 of Table 6-1. 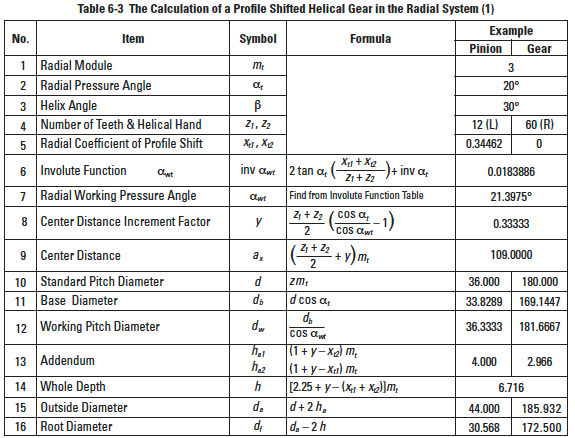 Table 6-3 shows the calculation of profile shifted helical gears in a radial system. They become standard if xt1 = xt2 = 0. Table 6-4 presents the inverse calculation of items 5 to 9 of Table 6-3. A representative application of radial system is a double helical gear, or herringbone gear, made with the Sunderland machine. The radial pressure angle, αt, and helix angle, β, are specified as 20° and 22.5°, respectively. The only differences from the radial system equations of Table 6-3 are those for addendum and whole depth. 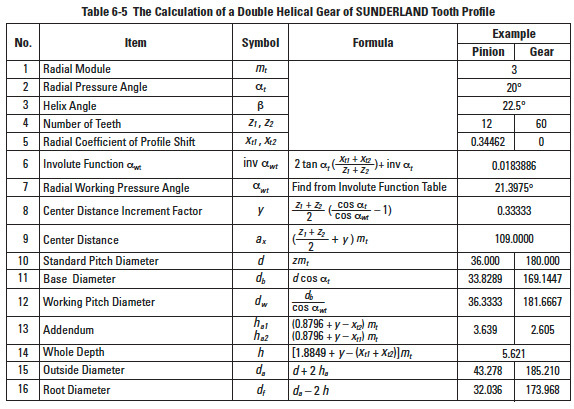 Table 6-5 presents equations for a Sunderland gear. Viewed in the normal direction, the meshing of a helical rack and gear is the same as a spur gear and rack. 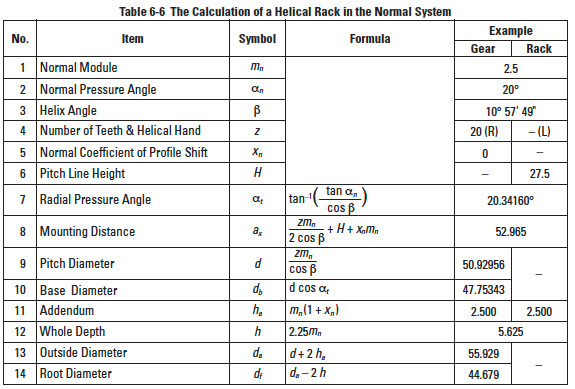 Table 6-6 presents the calculation examples for a mated helical rack with normal module and normal pressure angle standard values. 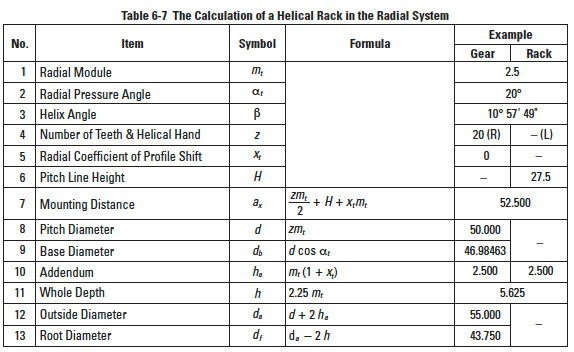 Similarly, Table 6-7 presents examples for a helical rack in the radial system (i.e., perpendicular to gear axis). The formulas of a standard helical rack are similar to those of Table 6-6 with only the normal coefficient of profile shift xn = 0. 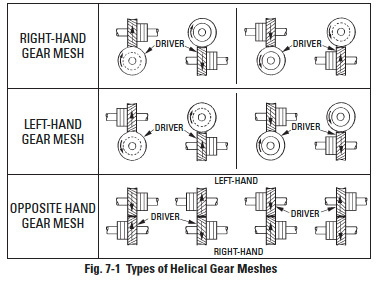 To mesh a helical gear to a helical rack, they musthave the same helix angle but with opposite hands. The displacement of the helical rack, l, for one rotation of the mating gear is the product of the radial pitch, pt, and number of teeth. 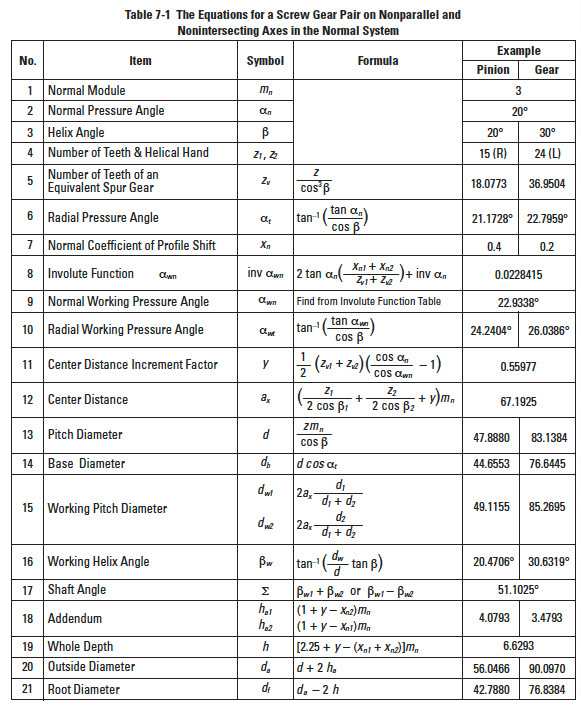 According to the equations of Table 6-7, let radial pitch pt = 8 mm and displacement> l = 160 mm. The radial pitch and the displacement could be modified into integers, if the helix angle were chosen properly. In the axial system, the linear displacement of the helical rack, l, for one turn of the helical gear equals the integral multiple of radial pitch. These helical gears are also known as spiral gears. 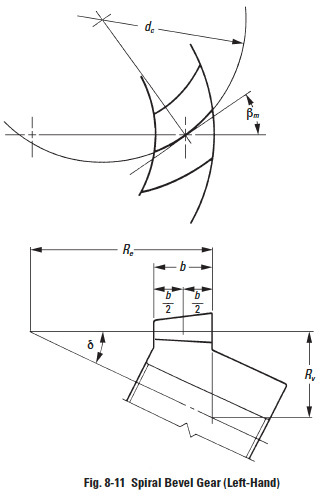 They are true helical gears and only differ in their application for interconnecting skew shafts, such as in Figure 7-1. Screw gears can be designed to connect shafts at any angle, but in most applications the shafts are at right angles. Helical gears of the same hand op erate at right angles. Helical gears of opposite hand operate on parallel shafts. Bearing location indicates the direction of thrust. Because of the possibility of different helix angles for the gear pair, the radial modules may not be the same. However, the normal modules must always be identical. Again, it is possible to adjust the center distance by manipulating the helix angle. However, helix angles of both gears must be altered consistently in accordance with Equation (7-1). If the screw gears were profile shifted, the meshing would become a little more complex. Table 7-1 presents equations for a profile shifted screw gear pair. When the normal coefficients of profile shift xn1 = xn2 = 0, the equations and calculations are the same as for standard gears. WT = axial thrust load, and Wt = transmitted load. The direction of the thrust load is related to the hand of the gear and the direction of rotation. This is depicted in Figure 7-1. When the helix angle is larger than about 20°, the use of double helical gears with opposite hands (Figure 7-3a) or herringbone gears () is worth considering. More detail on thrust force of helical gears is presented in SECTION 16. For intersecting shafts, bevel gears offer a good means of transmitting motion and power. Most transmissions occur at right angles, Figure 8-1, but the shaft angle can be any value. Ratios up to 4:1 are common, although higher ratios are possible as well. Bevel gears have tapered elements because they are generated and operate, in theory, on the surface of a sphere. 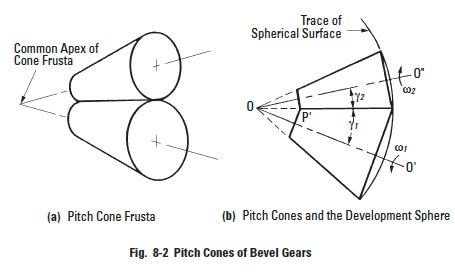 Pitch diameters of mating bevel gears belong to frusta of cones, as shown in Figure 8-2a. 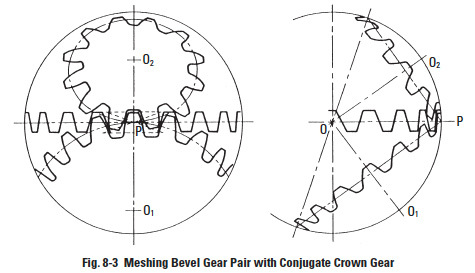 In the full development on the surface of a sphere, a pair of meshed bevel gears are in conjugate engagement as shown in Figure 8-2b. The crown gear, which is a bevel gear having the largest possible pitch angle (defined in Figure 8-3), is analogous to the rack of spur gearing, and is the basic tool for generating bevel gears. However, for practical reasons, the tooth form is not that of a spherical involute, and instead, the crown gear profile assumes a slightly simplified form. Although the deviation from a true spherical involute is minor, it results in a line-of-action having a figure-8 trace in its extreme extension; see Figure 8-4. This shape gives rise to the name "octoid" for the tooth form of modern bevel gears. Bevel gear teeth are proportioned in accordance with the standard system of tooth proportions used for spur gears. However, the pressure angle of all standard design bevel gears is limited to 20°. Pinions with a small number of teeth are enlarged automatically when the design follows the Gleason system. 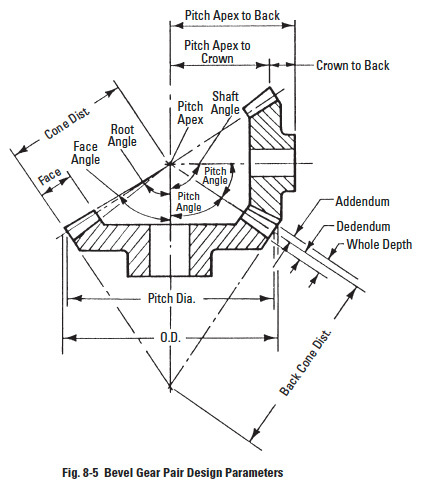 Since bevel-tooth elements are tapered, tooth dimensions and pitch diameter are referenced to the outer end (heel). 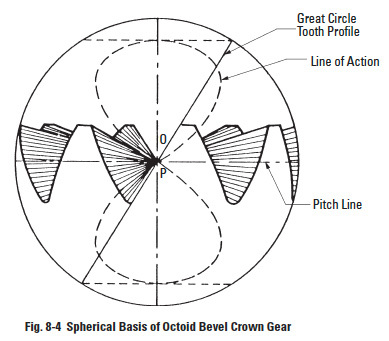 Since the narrow end of the teeth (toe) vanishes at the pitch apex (center of reference generating sphere), there is a practical limit to the length (face) of a bevel gear. The geometry and identification of bevel gear parts is given in Figure 8-5. In the simplest design, the tooth elements are straight radial, converging at the cone apex. However, it is possible to have the teeth curve along a spiral as they converge on the cone apex, resulting in greater tooth overlap, analogous to the overlapping action of helical teeth. The result is a spiral bevel tooth. In addition, there are other possible variations. One is the zerol bevel, which is a curved tooth having elements that start and end on the same radial line. Straight bevel gears come in two variations depending upon the fabrication equipment. All current Gleason straight bevel generators are of the Coniflex form which gives an almost imperceptible convexity to the tooth surfaces. Older machines produce true straight elements. See Figure 8-6a. When speeds are less than 300 meters/min (1000 feet/min) – at higher speeds, straight bevel gears may be noisy. When loads are light, or for high static loads when surface wear is not a critical factor. When space, gear weight, and mountings are a premium. This includes planetary gear sets, where space does not permit the inclusion of rolling-element bearings. • Coniflex gears (Figure 8-6b) are produced by current Gleason straight bevel gear generating machines that crown the sides of the teeth in their lengthwise direction. The teeth, therefore, tolerate small amounts of misalignment in the assembly of the gears and some displacement of the gears under load without concentrating the tooth contact at the ends of the teeth. Thus, for the operating conditions, Coniflex gears are capable of transmitting larger loads than the predecessor Gleason straight bevel gears. • Spiral bevels (Figure 8-6c) have curved oblique teeth which contact each other gradually and smoothly from one end to the other. Imagine cutting a straight bevel into an infinite number of short face width sections, angularly displace one relative to the other, and one has a spiral bevel gear. Well-designed spiral bevels have two or more teeth in contact at all times. The overlapping tooth action transmits motion more smoothly and quietly than with straight bevel gears. • Zerol bevels (Figure 8-6d) have curved teeth similar to those of the spiral bevels, but with zero spiral angle at the middle of the face width; and they have little end thrust. Both spiral and Zerol gears can be cut on the same machines with the same circular face-mill cutters or ground on the same grinding machines. Both are produced with localized tooth contact which can be controlled for length, width, and shape. Functionally, however, Zerol bevels are similar to the straight bevels and thus carry the same ratings. In fact, Zerols can be used in the place of straight bevels without mounting changes. Zerol bevels are widely employed in the aircraft industry, where ground-tooth precision gears are generally required. Most hypoid cutting machines can cut spiral bevel, Zerol or hypoid gears. 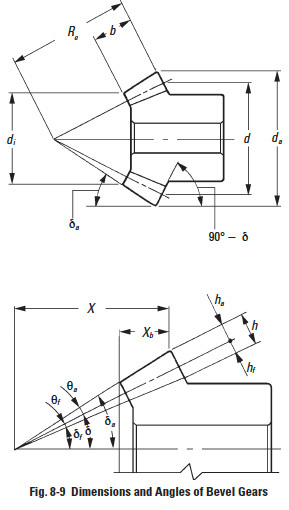 Generally, shaft angle Σ = 90° is most used. Other angles (Figure 8-7) are sometimes used. Then, it is called "bevel gear in nonright angle drive". 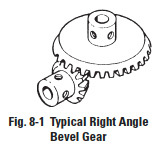 The 90° case is called "bevel gear in right angle drive". Miter gears are bevel gears with Σ = 90° and z1 = z2. Their speed ratio z1 / z2 = 1. They only change the direction of the shaft, but do not change the speed. 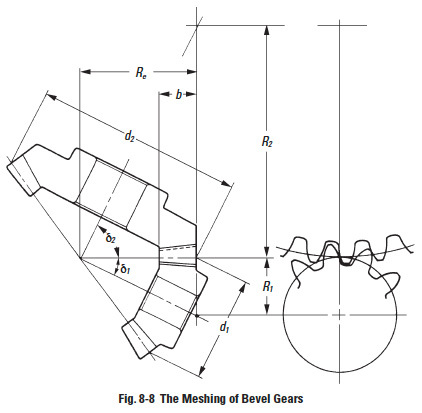 Figure 8-8 depicts the meshing of bevel gears. The meshing must be considered in pairs. It is because the pitch cone angles δ1 and δ2 are restricted by the gear ratio z1 / z2. 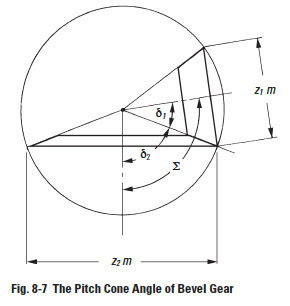 In the facial view, which is normal to the contact line of pitch cones, the meshing of bevel gears appears to be similar to the meshing of spur gears. The straight bevel gear has straight teeth flanks which are along the surface of the pitch cone from the bottom to the apex. Straight bevel gears can be grouped into the Gleason type and the standard type. In this section, we discuss the Gleason straight bevel gear. The Gleason Company defined the tooth profile as: whole depth h = 2.188 m; top clearance ca = 0.188 m; and working depth hw = 2.000 m.
In the Gleason system, the pinion is positive shifted and the gear is negative shifted. The reason is to distribute the proper strength between the two gears. Miter gears, thus, do not need any shifted tooth profile. The outer cone elements of two paired bevel gears are parallel. That is to ensure that the top clearance along the whole tooth is the same. For the standard bevel gears, top clearance is variable. It is smaller at the toe and bigger at the heel. Table 8-1 shows the minimum number of teeth to prevent undercut in the Gleason system at the shaft angle Σ = 90°. Table 8-2 presents equations for designing straight bevel gears in the Gleason system. The meanings of the dimensions and angles are shown in Figure 8-9. 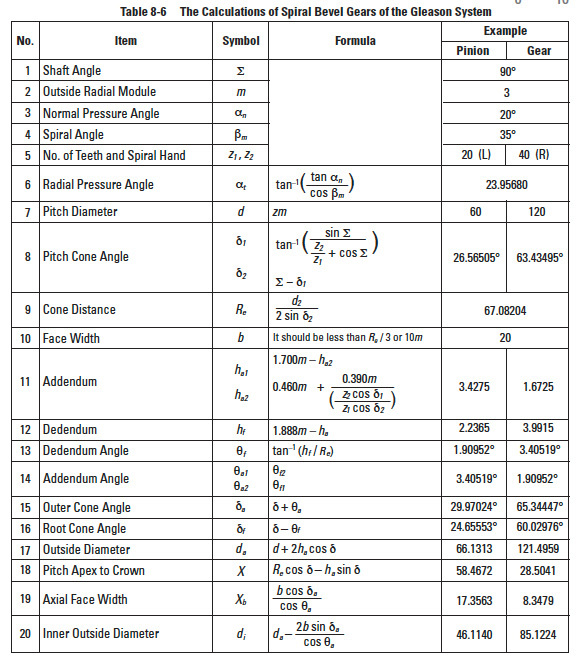 All the equations in Table 8-2 can also be applied to bevel gears with any shaft angle. The straight bevel gear with crowning in the Gleason system is called a Coniflex gear. It is manufactured by a special Gleason "Coniflex" machine. It can successfully eliminate poor tooth wear due to improper mounting and assembly. The first characteristic of a Gleason straight bevel gear is its profile shifted tooth. From Figure 8-10, we can see the positive tooth profile shift in the pinion. The tooth thickness at the root diameter of a Gleason pinion is larger than that of a standard straight bevel gear. A bevel gear with no profile shifted tooth is a standard straight bevel gear. The applicable equations are in Table 8-3. These equations can also be applied to bevel gear sets with other than 90° shaft angle. 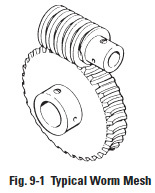 A spiral bevel gear is one with a spiral tooth flank as in Figure 8-11. The spiral is generally consistent with the curve of a cutter with the diameter dc. The spiral angle β is the angle between a generatrix element of the pitch cone and the tooth flank. The spiral angle just at the tooth flank center is called central spiral angle βm . In practice, spiral angle means central spiral angle. All equations in Table 8-6 are dedicated for the manufacturing method of Spread Blade or of Single Side from Gleason. If a gear is not cut per the Gleason system, the equations will be different from these. 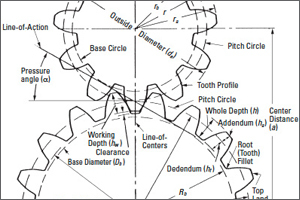 The tooth profile of a Gleason spiral bevel gear shown here has the whole depth h = 1.888 m; top clearance ca = 0.188 m; and working depth hw = 1.700 m. These Gleason spiral bevel gears belong to a stub gear system. This is applicable to gears with modules m > 2.1. 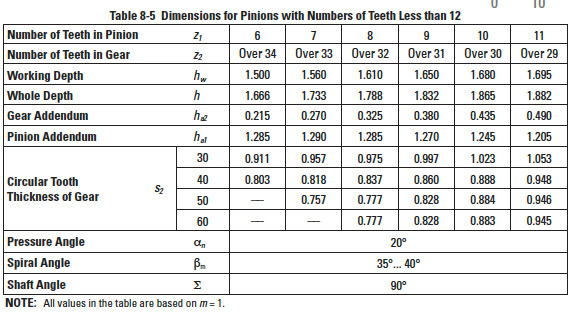 Table 8-4 shows the minimum number of teeth to avoid undercut in the Gleason system with shaft angle Σ = 90° and pressure angle αn = 20°. If the number of teeth is less than 12, Table 8-5 is used to determine the gear sizes. 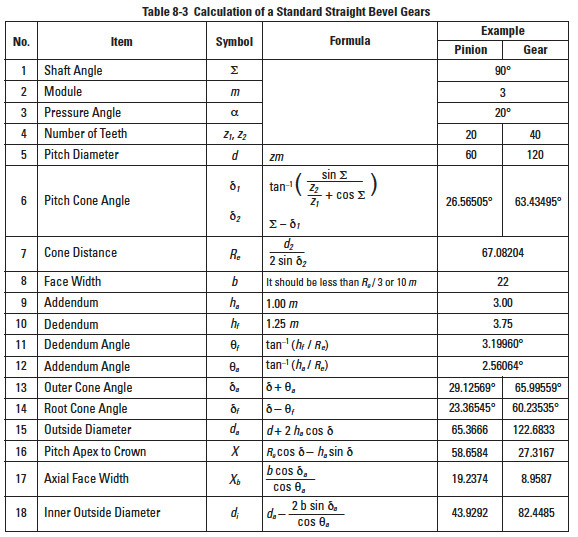 All equations in Table 8-6 are also applicable to Gleason bevel gears with any shaft angle. A spiral bevel gear set requires matching of hands; left-hand and right-hand as a pair. 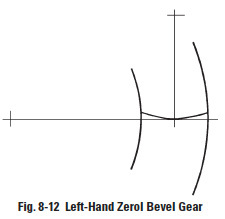 When the spiral angle βm = 0, the bevel gear is called a Zerol bevel gear. 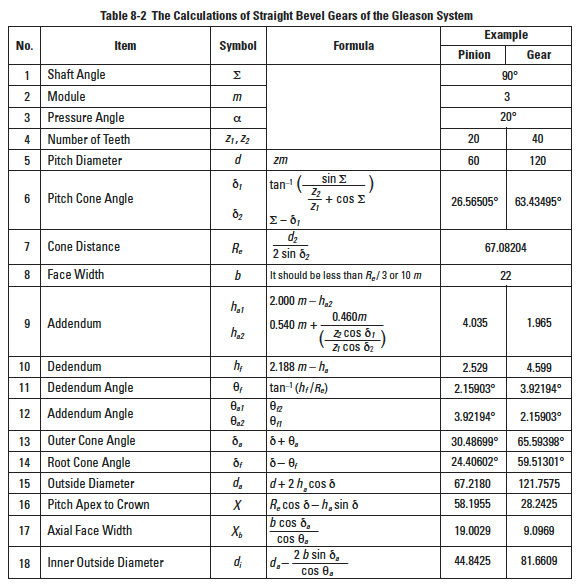 The calculation equations of Table 8-2 for Gleason straight bevel gears are applicable. They also should take care again of the rule of hands; left and right of a pair must be matched. Figure 8-12 is a left-hand Zerol bevel gear. The worm mesh is another gear type used for connecting skew shafts, usually 90°. See Figure 9-1. Worm meshes are characterized by high velocity ratios. Also, they offer the advantage of higher load capacity associated with their line contact in contrast to the point contact of the crossed-helical mesh.